A sight well worth setting your alarm for is the close conjunction of the old crescent Moon and a dazzling planet Venus just ten days away from attaining greatest brilliancy on the morning of Thursday, 10 September, an hour before sunrise. For the centre of the British Isles, this is around 5:30 am BST. The pair will lie just 2 degrees apart, easily encompassed by the field of view of most binoculars. Observers with especially clear skies may glimpse much fainter Mars before the twilight gets too bright, a span of a fist at arm’s length to the left of Venus. Note: the Moon is slightly enlarged for clarity. AN graphic by Ade Ashford. As dawn creeps across Western Europe on the morning of Thursday, 10 September, a close conjunction of the two brightest objects in the nighttime sky is taking place in the constellation Cancer, low in the east an hour before sunrise. Observers in the UK wishing to see the beautiful juxtaposition of dazzling magnitude -4.5 Venus (the planet reaches greatest brilliancy on 20 September) and the slim, waning crescent of a 26-day-old Moon should set their alarms for 5:30am BST. The pair will lie just two degrees (or four full Moon breadths) apart, fitting comfortably in the same field of view of any typical binocular. Given the Moon’s age in this lunation, its crescent phase on Thursday morning is a svelte 9 percent. Venus is a shade over 45 arcseconds in diameter, so a telescope magnification of just 40x will enlarge it to the same apparent size as the Moon to the naked eye. Virtually any telescope, then, will show that Venus also has a slim, 17 percent illuminated crescent matching the orientation of the Moon. The Moon lies 247,800 miles (398,800 kilometres) distant on the morning of 10 September, while Venus is 138 times further away — 34.3 million miles (55.2 million kilometres) from Earth, to be precise. If your eastern sky is particularly clear, look out for second-magnitude planet Mars ten degrees (the span of a fist at arm’s length, or two 10×50 binocular fields) to the left of Venus. There is currently a difference in brightness exceeding 300 times between these two planets! 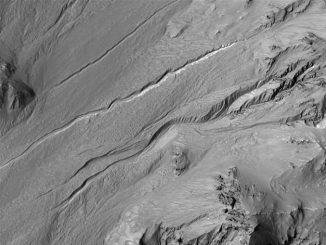 Mars lies 230.4 million miles (370.8 million kilometres) from Earth on the morning of 10 September, so it is perhaps not surprising that its disc measures a paltry 3.8 arseconds across. 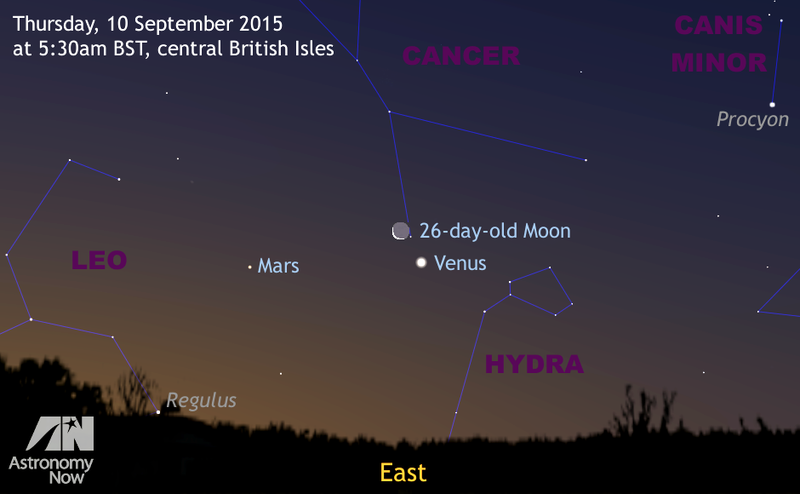 Mars next comes to prominence at opposition in May 2016. Clear skies! You can find out more about observing Venus and the Moon in the September edition of Astronomy Now in addition to a full guide to the night sky. Never miss an issue by subscribing to the UK’s biggest astronomy magazine. Also available for iPad/iPhone and Android devices. 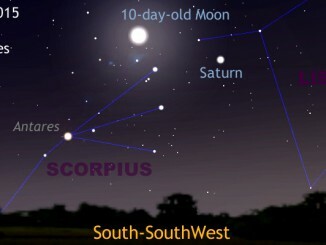 Saturn’s summer apparition for 2015 is drawing to a close as the ringed planet is highest in the southern sky before sunset for observers in the British Isles, but it can still be found in the bright evening twilight if you have a convenient guide — like tonight’s gibbous Moon. Life is hard for a little moon. 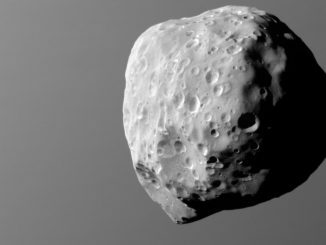 Epimetheus, seen here with Saturn in the background, is lumpy and misshapen, thanks in part to its size and formation process.